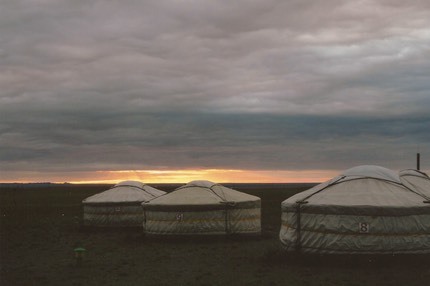 Mongolia, land of Ghengis Khan, and also, we were to find out, land of no flipping summer and no warm nights. 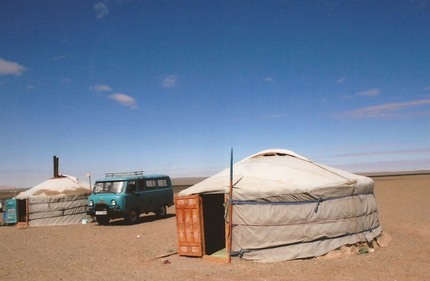 Arriving from Beijing into Ulan Bator you see suburbs where people still live in Gers, the round felt tent, as they migrate from the countryside. You also see massive power stations. 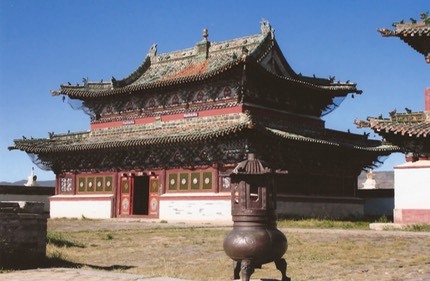 We stayed in the big hotel in the centre next to the parliament building and it does not take long to see that this is a country completely built around the legend of Ghengis. Our trip was to consist of a large circuit driven in a Ukrainian van with Batcha our driver and Chinzo, our guide. 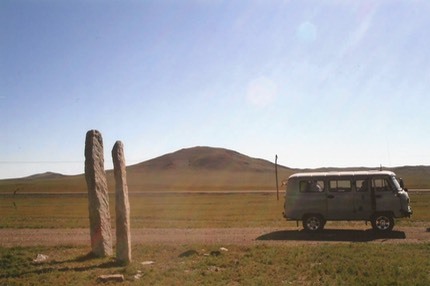 Seen below, is our van parked near some ancient grave stones. We headed south to visit Mandalgobi and stay with Chinzo's parents where they have a nursery which originally was used to grow plants to reclaim land from the expanding Gobi desert, but is now more of a hobby. Onward to the Gobi itself, where we stayed with a local family and then trekked into the desert on camels and camped overnight. It was freezing. You travel great distances in Mongolia to get between the odd rock or a tree or such like. The guy who owned this place had appeared in the Attenborough spectacular, The Human Planet. His name was Ganbold and the episode was the one about the grasslands, and in particular, the keeping of camels. 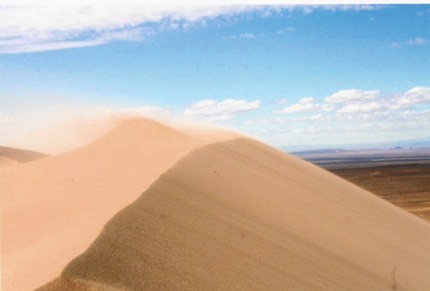 This is the tallest sand dune in the part of the Gobi we were in, so it had to be climbed. Unbelievably tiring, as every step came back towards you, so you only advanced about 3 inches per step. It was also very windy at the top, so a faceful of sand was the order of the day. It is called the singing dune, and to understand why you have to run down. The singing comes from your feet as it bashes the sand. Once you start running there is no stopping until you reach the bottom, or fall over. We stayed in a few tourists Ger camps where you get one to yourself and there is a large central one that is the restaurant. You really need the log fire as it is very cold at night. Eagle gorge was a challenging walk where we saw Lammergeier vultures and a lot of small hamster like things. This sunrise came after a night of heavy snow in Eagle Gorge where we had been the previous day. It had been cold enough anyway, but at least we were prepared unlike the 3 German tourists we came across who were freezing cold in light summer rain macs. We had our Antarctic gear on. 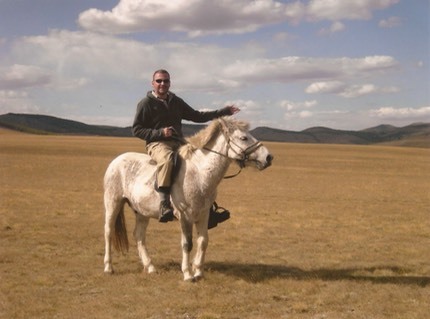 We spent 4 nights with a family which was very relaxing, with some nice walks with good birding opportunities, and also the chance to do some horse riding on the very stocky mongolian horses that are as tough as nails. there was also a hot water spa where we soaked for an hour or two. Our final major stop was at Ghengis's old capital where a substantial temple complex still exists, having escaped the ravages of Stalin. Monks still pray here and we got the chance to sit in on a chanting session.